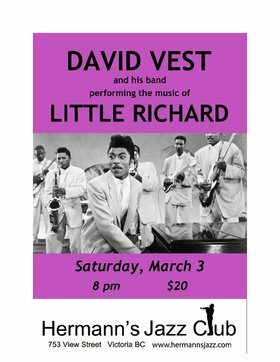 Event Archive - David Vest plays Little Richard: David’s band includes Damian Graham, Ryan Tandy, and Tom Bowler, plus frequent guests. $20 at the door only. The music was wild, and the stories were even wilder. 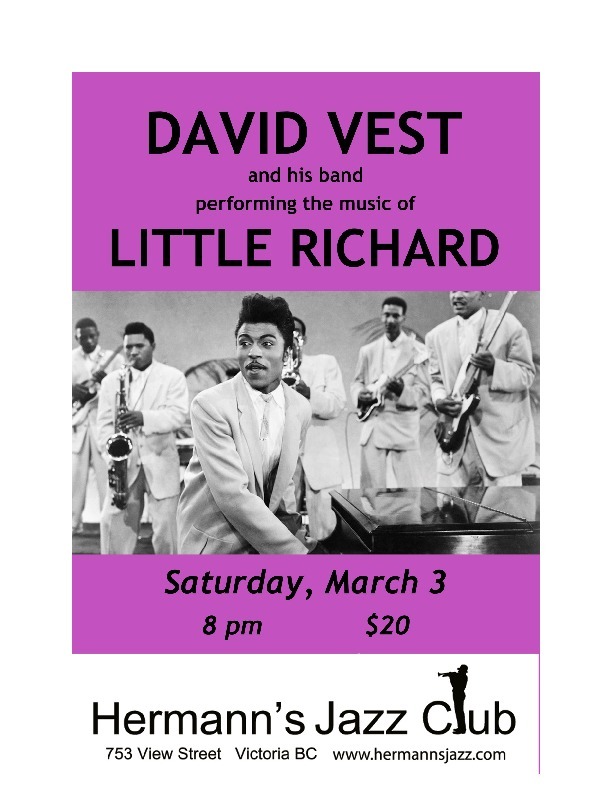 David Vest and his band salute the beautiful Little Richard, the architect of rock and roll. Richard’s achievement goes far beyond the handful of hits he’s famous for. At various times his band members included Jimi Hendrix, James Brown and a host of other legendary sidemen. The Beatles were his opening act. Above all, Little Richard is and was a fabulous piano player! They don’t come any more real than David Vest. The son of an Alabama sharecropper, David has been rockin’ and shoutin’ the blues since 1957 and shows no sign of slowing down. This year he won Canada’s national Maple Blues Award for piano player of the year for the 4th time. His song "Worried About The World" was covered by Downchild on a Juno-nominated album.